Peak increases in yield of 13% were observed when manure was applied at 50% to 75% of crop N requirements. Attempting to substitute more than 75% of the crop N requirement with manure often produced reduced yields. It is important to recognize the complimentary roles that manure and commercial fertilizer can play in a crop fertility program. Increasing soil C levels can increase the risk of greenhouse gas emissions. However, this study suggested there were no changes observed in emissions of potent greenhouse gases, nitrous oxide (N2O) and methane (CH4). However, some increase was observed in CO2emissions due to greater soil microbial activity. 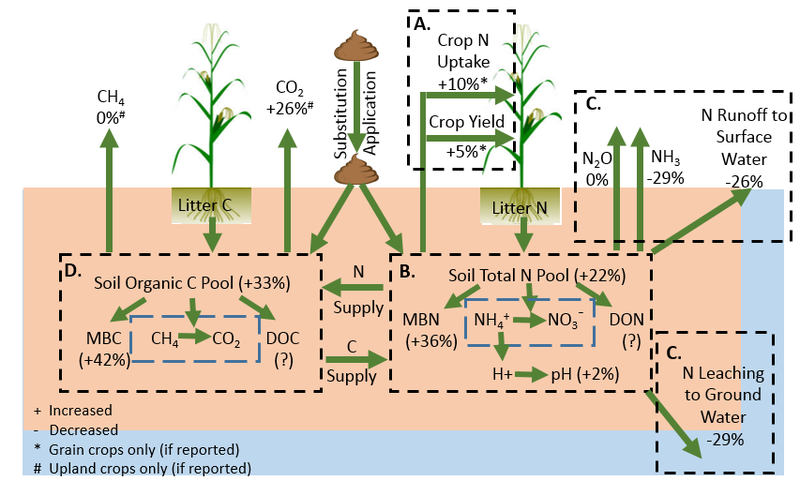 Overall, manured soils proved to be a sink for carbon in upland fields, thus benefiting the environment. Funding support is from North Central Region Water Network (http://northcentralwater.org/ ). More information on Manure and Soil Health including past blog articles can be found at http://soilhealthnexus.org/.